It is 8am on a particularly chilly morning, and although the Imola F1 circuit in northern Italy should be in hibernation, the place is bustling with activity. A day like today is a mix of birthday, Christmas and seventh heaven: one factory test driver, two journalists, three fast cars and no time limit. We’re here to drive the Lamborghini Huracan Performante, a special-edition super-Huracan with more power, careful chassis revisions and innovative active aerodynamics. It’ll bow in officially at the 2017 Geneva motor show in March, but we’ve got behind the wheel early – hence the swirly black-on-white shower curtain foil camouflage to keep its contours under wraps (quite literally) until showtime. Lamborghini Huracan Performante – what’s lurking beneath the disguise? You might remember the Lamborghini Gallardo Performante, a lighter, angrier, stripier version of the Huracan’s ancestor. This time, the Performante label stands for much more than fancy wheels, loud stripework and 15 or 20 extra horsepower. ‘The new Performante is in essence a Super Trofeo [the one-make Huracan racing series] car for the road,’ states senior vehicle development manager Dennis Schmitz, beaming with pride. 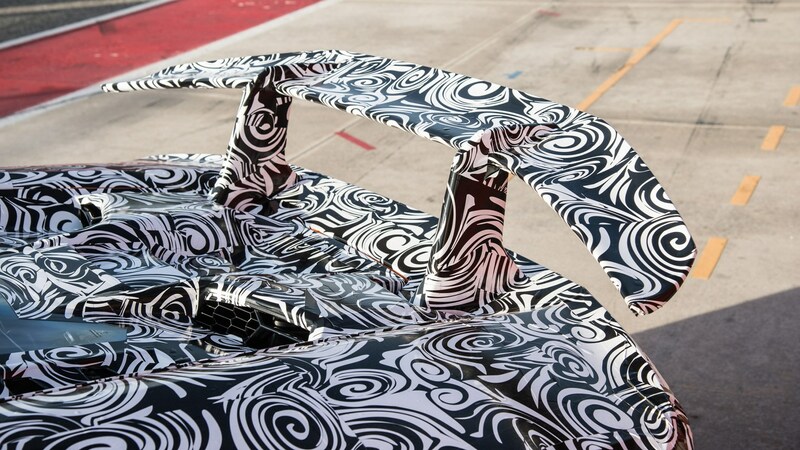 Despite the camouflage, one quickly deciphers a redesigned nose cone, revised air intakes and an imposing rear wing which sits on two wide mounts. More spoilers, new rims, fresh make-up - is this really all it takes to create a so-called dynamic miracle? Apart from the aero wizardry, there’s also a 10% increase in power and an extra 30lb ft of torque, a 40kg reduction in weight, bespoke Pirelli P Zero Corsa tyres, more aggressively calibrated all-wheel-drive and ESP controls, a freer-breathing exhaust with high-mounted tailpipes, a faster shifting seven-speed dual-clutch transmission, and notably stiffer suspension mounts. Because there’s a business case for it. Although both the Huracan and Aventador are doing well in the market place, money is tight at Lamborghini. Before the marque’s r&d chief Maurizio Reggiani and his team get the nod to introduce an all-new design or an additional product, they must first milk the existing range by launching at least two highly profitable special edition models per year throughout the life cycle – like this one. ‘In today´s economic climate, we must fight for our goals every step of the way,’ says Reggiani. Impatiently waiting to prove his point are three blat-blatting Huracans sitting in chatty convoy at the entrance to the pit lane. 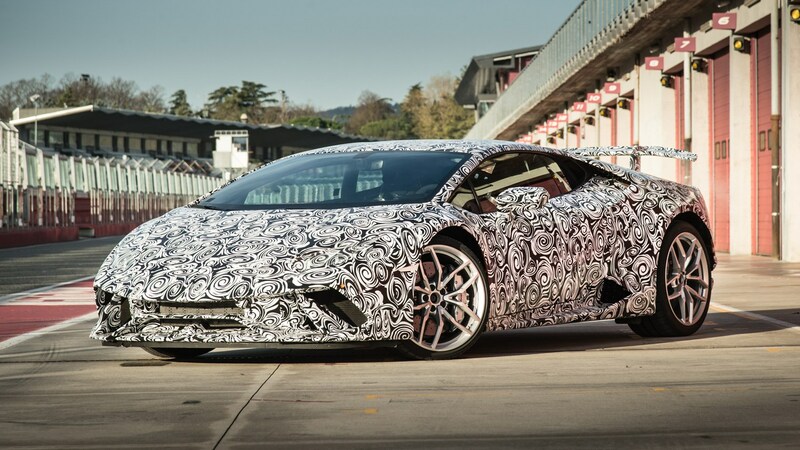 At the wheel of the silver lead car is the factory test driver Pierluigi Veronesi; car number three looks standard from bottom to top except for a wild green paint job; and in the middle, wearing its psychedelic outfit, is the Performante. Come on, what’s the Huracan Performante like to drive? Even with an amateur behind the wheel, the Performante feels invincible. Not because of the increased power and torque; it´s the transformed roadholding which makes you shake the head in disbelief, again and again. Superglue, velcro strap and magnet are terms that come to mind, but they don´t do this Lambo justice. Because in addition to the new tyres’ extra mechanical grip, ALA provides real, racecar-esque ground effect. Compared with the standard Huracan, it can brake later, carry more momentum towards the apex, and lay on the power earlier. With the possible exception of the tightest chicane, there isn´t a single second-gear corner at Imola. Instead, the mind is boggled by plenty of high-speed stuff, even hooking sixth toward the end of the start-finish straight. Not surprisingly, Pierluigi knows the circuit inside out, but the Performante’s ALA allows me to go pedal-to-the-metal through the second half of the Tamburello corner where he must feather the throttle ever so slightly, inviting me to snap at his heels and pull out of his slipstream momentarily just for the heck of it. Through Imola’s faster sections, the automatic fine-tuning of the air flow is a real eye-opener. At this circuit at least, it puts the Performante in a league of its own somewhere between Huracan and Aventador. How does the Active Lamborghini Aerodynamics (ALA) system work? The adaptive airflow management employs three small electric motors operating two deflector sets, one in the front bumper and one inside that unique rear wing. Depending on the chosen drive mode, these flaps open and close independently or simultaneously. In Strada, they both open at around 43mph, and above 190mph, the front air flow control blades close to reduce lift. In Sport, both flaps open to boost downforce in the critical 40mph to 110mph bracket. Beyond 190mph, the rear flap opens for maximum drag reduction. In track-biased Corsa mode, there is a constant front-to-rear and left-to-right interplay to optimize the cornering performance. The aerodynamic balance is in essence determined by lateral and longitudinal acceleration. While the fast-acting single electric motor squashes axle lift by closing the front flaps, the rear wing is a much more complex assembly. The hollow wing profile consists of two separate chambers and a pair of narrow full-width underside slots. The air flow is masterminded (and split, more often than not) by two independent aero shutters attached to the base of the two hollow stanchions which support the main spoiler. Progressively picking up speed, air enters the wing and is compressed before exiting through one or both concealed slot diffusors, thereby creating substantial downforce. The benefit is symmetrical load under hard braking, and aero vectoring automatically shifts the load to the inner rear wheel when cornering at the limit of adhesion. The system does not only generate a precious extra 0.2 to 0.4g within fractions of a second, it also suppresses understeer by permitting smaller steering angles. I see… Anything else new, apart from the aero trickery? Perhaps the most significant dynamic alteration otherwise is the reprogrammed steering. The effort is now slightly higher in Strada, the ratio quickens in Sport, and there is no longer any variation at all in Corsa, exactly the way Porsche does it. Back pressure is an alien term to the rowdy lightweight free-flow exhaust, and the substantially stiffer chassis is a tangible asset when fighting Imola’s kerbs. We’ll let you know if he’s being optimistic when we drive the production Performante on the road in the near future. It´s a pain to get in and an embarrassment to get out (and the sharp-edged shift paddles left my fingertips black and blue), but what happens between these two procedures is dazzling, physical and addictive. The Performante sounds rawer and meaner than the regular Huracan, it pushes the output of the turbo-free long-stroke V10 to 650bhp (final figures won´t be available before March 2017), it draws an even prouder torque curve and, according to overheard gossip, it will shave two tenths off the 0-62mph acceleration time. Top speed may not matter much anymore these days, but at a rumoured 210mph, this bull would for instance eclipse the top Audi R8 V10 Plus for Top Trumps bragging rights. While the Performante may not beat the Ferrari 488 and McLaren 570S in the nominal bhp, lb ft and mph sweepstakes, it is bound to keep in close touch with its rivals in real life thanks to the game-changing adaptive aerodynamics. Driving the Huracans was fun and hard work. By one o´clock, we had each covered more than a full GP distance, and it showed: plenty of marbles on the front and the windscreen, doomed tyres with ragged shoulders, and the fuel gauge near empty. But who cares about comfort when there are only eight more laps left to scream the heart out of this Huracan extraordinaire?